Are they nature’s mistakes or do we not understand nature’s processes? In the same way that a volcanic island is colonized by lichen & moss, then grasses, ferns and woody shrubs, eventually to become a tropical forest, the perspective of time is worth bearing in mind when observing the landscape. Certain plants create the conditions needed for others to thrive. This natural succession of species may take longer than one human lifespan. The more we try to create limited species landscapes, the harder Nature tries to redress the imbalance. 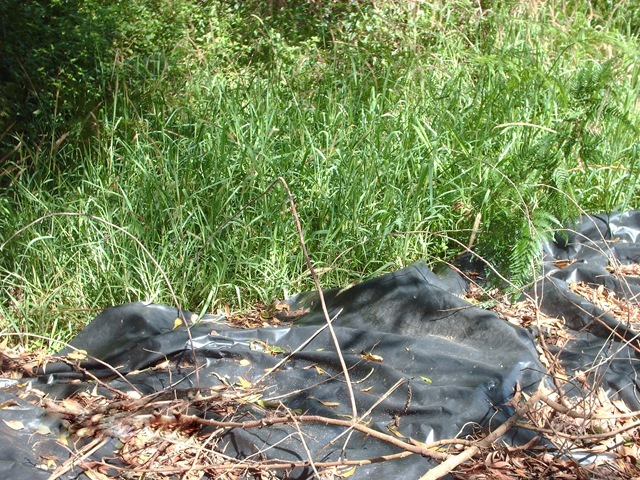 It is our own activities (disrupting existing ecosystems) that create the conditions for invasion by weeds. A great many common plants we now regard as garden weeds were once considered medicine & food, hence their introduction. If you already have them present, then understanding & using this freely available resource could be beneficial to our own good health! Rule no. 1: A mature natural landscape has a wide range of species, symbiotically inter-connected, each supporting/feeding another. Rule no. 3: Nature abhors a vacuum. Think of weeds as ‘scabs’ for the soil- they may be ugly, but they protect the damaged surface while it heals (if we keep picking them off it will only take longer). Empty spaces (bare soil) will be colonized. Natural stacking (different height & growth types- deep-rooted, suckering, ground hugging, climbing etc) will fill every gap. Rule no.4: Nature tends towards diversity & abundance. Many of the plants we think of as ’taking over’ the landscape (such as lantana) thrive in areas that were once dense forests or complex mixed landscapes. Of course they run rampant, it is in the very nature of the climate zone(sub-tropical Northern NSW). For a period of time a single species ‘appears’ to dominate & prevent the proliferation of anything else. But in a long range perspective, after 100 years of land clearing, burning, slashing & grazing, it’s not surprising so few native varieties germinate, where would the seed stock come from? Rampant weeds like lantana & blackberries at least prevent topsoil erosion, create biomass to build up the soil & provide shelter for seed bearing birds. Eventually, vigorous native pioneer species, (marangas & wattles) appear, and although lantana will grow up these (relatively) short lived trees & possibly strangle & pull them down, a more complex topsoil is being created & long-lived top-story trees (rainforest) that sprout in low light conditions will push through & overtake the vines. Weeds like camphor laurel & lantana are often spread by birds, whose native food sources we have destroyed. By providing habitat and food even these trees play a part in protecting wildlife while they spread the seeds of native varieties from remnant forests. Unless we can replace these interim species, it may be best to let them do the work for us. Consider the possible benefits as well as the negative impacts before determining the necessity of eradication. I am not referring here to intact native landscapes, but to those areas we have already altered. Of course, it is important to be mindful of introducing any new potential pest species so as not create more future imbalances & restrict the further spread of invasive exotic weeds in the natural landscape. So now to gardening: Remember Nature’s plan & imitate her processes. Leave well enough alone & don’t bite off more than you can chew. Before clearing an area, make sure it can be immediately replanted. 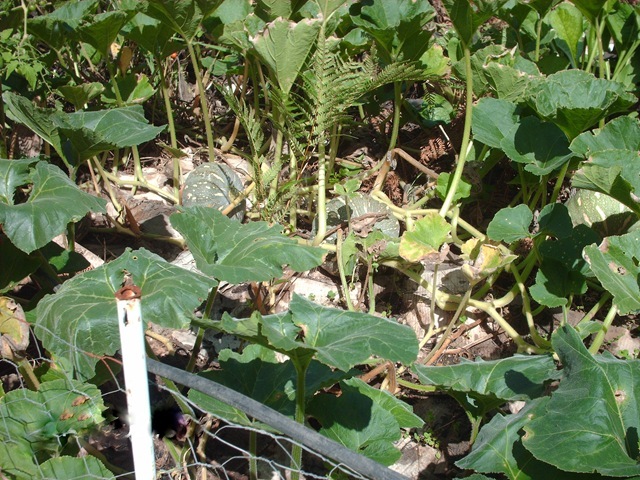 Try to grow many varieties & many different growth types- avoid monocultures; mixed plantings are less likely to deplete the soil of any one nutrient & will contribute different mineral/nutrient combinations in leaf litter. Plant thickly to fill gaps & mulch heavily to protect bare soil & impede new undesirable weeds sprouting. Throw weeds back on the ground where they grow (upside down to kill the roots) or compost them. 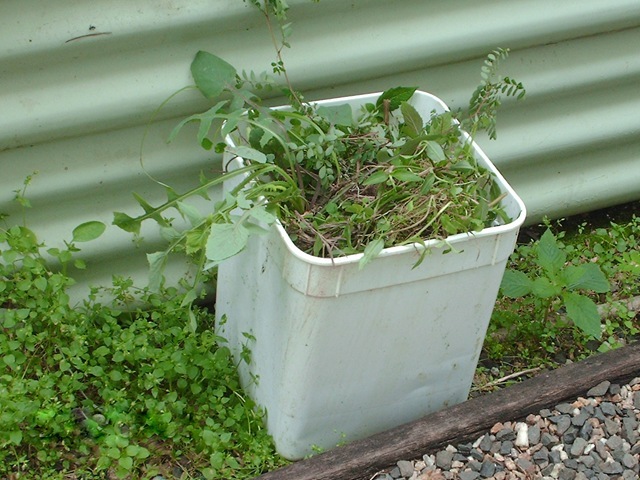 If they are flowering or forming seeds (& at their most vital) make a liquid weed tea fertilizer to prevent them germinating – cover with water in a bucket for several weeks to rot the seeds & & use the resulting liquid tofeed the soil. Add EM-1 (Effective Micro-organisms) to promote fermentation & dynamic accumulators such as comfrey, tansy, dandelion & nettles. Just as seasonal vegetables & herbs are best for our health – so too with weeds. Consider the properties of any plants added to the mix, such as aloe vera for heat stress, woody & deep rooted weeds for strength etc. USE the medicine Nature suggests! 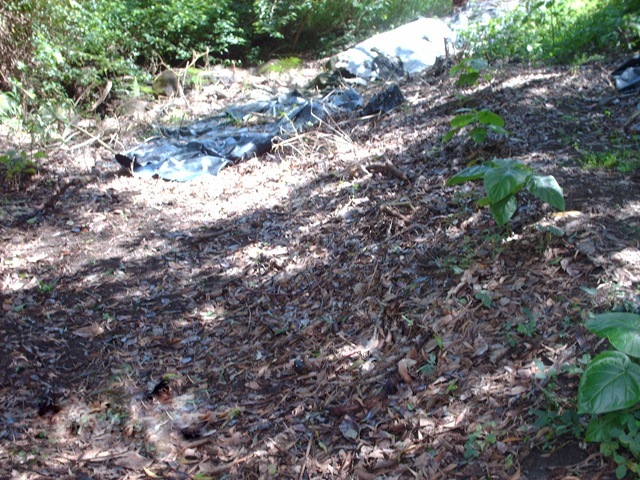 Right- Sheet mulching with cardboard held down with branches. I use cardboard for heavily infested areas & leave for months. 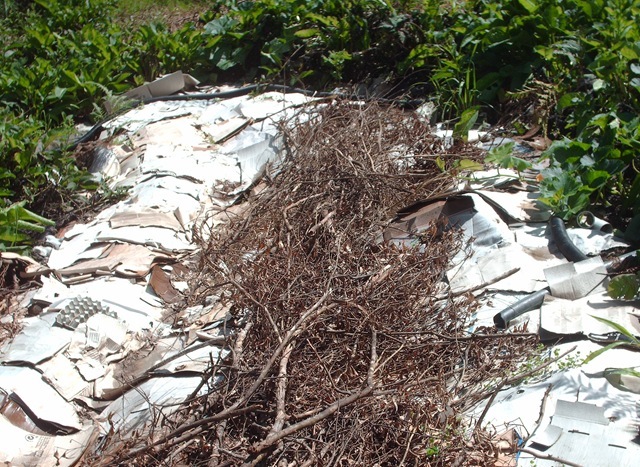 Newspaper mulch breaks down faster & can be covered with mulch for better insulation in vege gardens. Such treatments may seem untidy but saves work! Left- cardboard planted over with pumpkin vines. 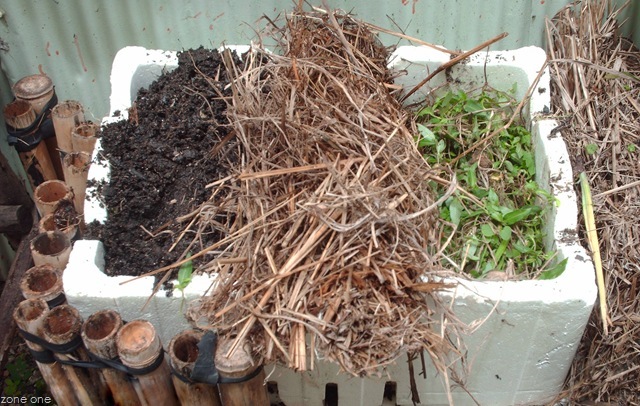 Ingredients for an instant garden: layer box with mixed weeds at bottom, cover with newspaper, straw mulch & worm castings, finish with topsoil or potting mix & plant! 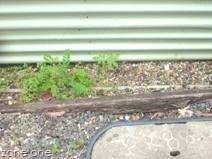 This entry was posted in grow food, soil and tagged weeds by zoneonesustainableliving. Bookmark the permalink.